Weather: unseasonable warm with temps in the 60’s. 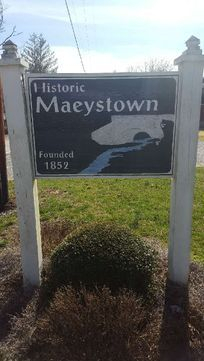 To celebrate Trish’s 29th perpetual birthday, I booked a room in the historic southwestern Illinois metropolis of Maeystown. (population 158). 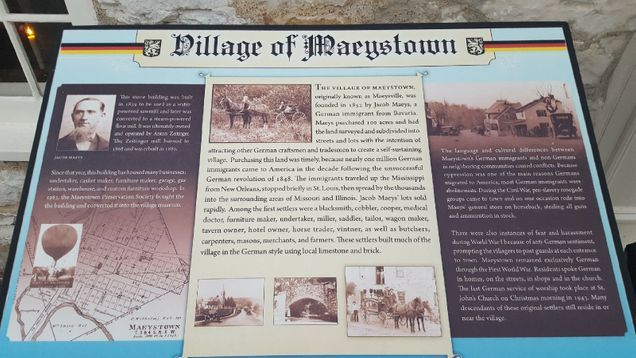 This 165 year old German community is located a hayride from the Mississippi River and the town of Waterloo. 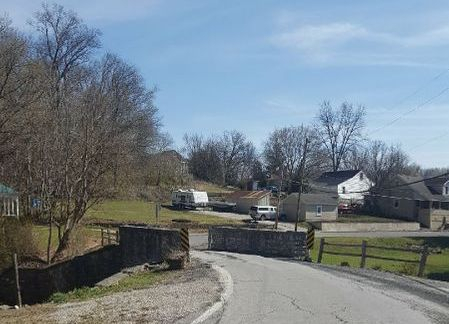 While looking for a weekend getaway close to home, we stumbled across this quaint little community which is on the National Registry of Historic Places, well-known for containing over 60 stone, wood and brick buildings dating into the 1800’s. During our research we found no history of haunting, but took along some basic equipment, anticipating that we may detect something based on the rich antiquity of the location. We arrived early afternoon and took a stroll down Main Street, checking out the gift shops as we made our way to the famous one lane stone bridge entrance into town. There we decided to do a short EVP session. With little going on, no meter hits, no boo buddy responses etc. we walked the rest of the town, but left the recorder rolling. With dusk settling in we sat outside for a few minutes then decided to stroll across the street to the local restaurant/bar. We returned to our room after partaking of some passable food but really enjoyed the great people watching. We were no more in the door when we turned on a light switch and were sent into total darkness! Every light in the room went out at the same time with a loud popping sound. Coincidence? We contacted the innkeepers who gave us a choice of two rooms upstairs that were open. Even though it was only 10:30 pm, we were pretty wiped out so decided we would do a quick rod session before lights out…again. With my usual success rate using the rods just over 0.1% we weren’t expecting too much, but Trish and I were amazed when they began working for me, to the point of spinning! It was startling to say the least, having more action that night then I have had in my previous 6 years of searching for the truth! When CAPS member Vicki was going through our recordings for us she found two very clear EVPs that paralleled my use of the rods. The fact that the female says “…trying to stab you” did not bother me a bit since I didn’t know about it till weeks later. Maybe the male saying “…on my knees” means he was begging the female spirit for mercy? Trish slept fitfully, feeling uneasy and uncomfortable all night. Thankfully the morning brought a wonderful breakfast in the ballroom with a young couple from Kansas City who had stayed in a cabin in the back yard. We paid up and promised the owners we would certainly come back to celebrate another of Trish’s 29th Birthdays. Curiously the recorder picked up a child...there were none around! This one was captured on a recorder running all night. Sounds like "David". Another EVP was captured on a recorder left running overnight. This one sounds like they are saying "Trish". This EVP of a male was also captured during the dowsing rod session. A male voice speaks faintly just before Dave and after more strongly saying "on my knees". Another one caught that sounds like a child. May say "Keep it"? Around 2 seconds sounds like a gasp. Then a male voice seems to say "misfire". While the dowsing rods were working, this female voice chimes in "Trying to stab you"?